Well, the votes have been cast…we’ll be doing brief biographies of military leaders from the American War of Independence for the rest of this month. Sorry to disappoint anyone, but George Washington is not on the list. It’s time to dig deeper into the history books and find some of those “forgotten” leaders. Meet our military leader for the week: General Nathanael Greene. (No, I didn’t misspell his name…) When the war started, he was a militia private…when the war ended, he was one of General Washington’s most trusted commanders. 1. Pre-War Life Born on August 7, 1742, Nathanael was the son of a Rhode Island Quaker. As a lad, he self-educated himself and helped with the family’s business; at age 28 he was overseeing the foundry shop. It is believed that Greene served in the Rhode Island General Assembly in 1770, 1771, 1772, and 1775, but it’s possibly that it could have been another Mr. N. Greene. In 1774 he married Catharine Littlefield; they would have 6 children. As a conflict with Britain simmered as the taxes increased and foreign trade was limited, Nathanael helped to organize a local militia unit and studied military books. The peaceful Quaker community was shocked that one of their members would study war and expelled him from their church. 2. 13 Battles in 8 Years In 1775 after the British vs. American conflict began, Nathanael Greene was promoted from militia private to major general of the Rhode Island Army. Local authorities were aware of his leadership and military knowledge. Of greater importance was his promotion to brigadier general of the American Continental Army on June 22, 1775. The following year, General Washington sent General Greene to control the city of Boston after the British evacuated. In his letters, Greene expressed support for a declaration of independence which would separate the Colonies from England and make them a new nation. Greene fought with General Washington’s army in the New York campaigns of 1776, and the Philadelphia campaign of 1777-1778 (includes Valley Forge winter). As commander of the West Point (a fort, not a military school in those days), he presided over the court which condemned Major John Andre, who had been an accomplice in Benedict Arnold’s traitorous plots. The most important part of General Greene’s military service was when he was sent to the Carolinas in 1780. The war in the Carolinas was a mess – literally; before Greene, every American commander sent there had managed to lose an important city or suffered a crushing battlefield defeat. The situation didn’t make it any better: guerilla warfare was common and some of the cruelest British officers operated in this area (anyone know about General Tarleton?). When General Washington was asked to appoint a new commander for the Southern region, he chose Nathanael Greene; in this new position Greene was basically second in command of all Continental forces. Greene divided his southern army and started on a “strategic retreat” – along the way the Battles of King’s Mountain and Cowpens were American victories. With an army of about 2,000 men, Greene managed to cross the Dan River into Virginia, but a week later he returned to North Carolina. A series of battles, skirmishes, and maneuvers eventually forced the British to return to the coast, concluding with a siege of British-held Charleston. General Greene had forced the British to retreat and give up most of the Carolinas. 3. Post War Life Nathanael Greene was given land grants in North Carolina, South Carolina, and Georgia. Some of the property he sold to pay for the rations his army had needed. He was offered the Secretary of War office, but refused. In 1785 Greene moved his family to Georgia. He died a year later from the effects of sunstroke. What made Nathanael Greene an outstanding leader? 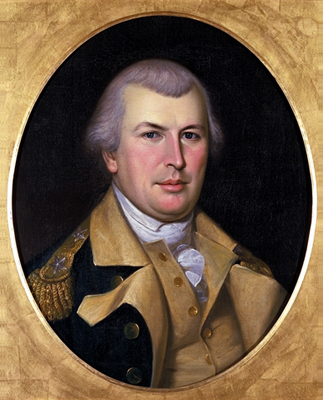 In summary Nathanael Greene prepared to serve his country, became one of General Washington’s most skilled commanders, and successfully regained American control of the Carolinas region. Thanks for keeping it short, hard as it is. What a character! I had heard the name and knew he was a smart guy, but that is amazing. Strong convictions, and I think you could certainly call him a hero of the American Cause. Glad you enjoyed the post. I was amazed by all that he accomplished and his “innovative” strategies in the Carolinas too.